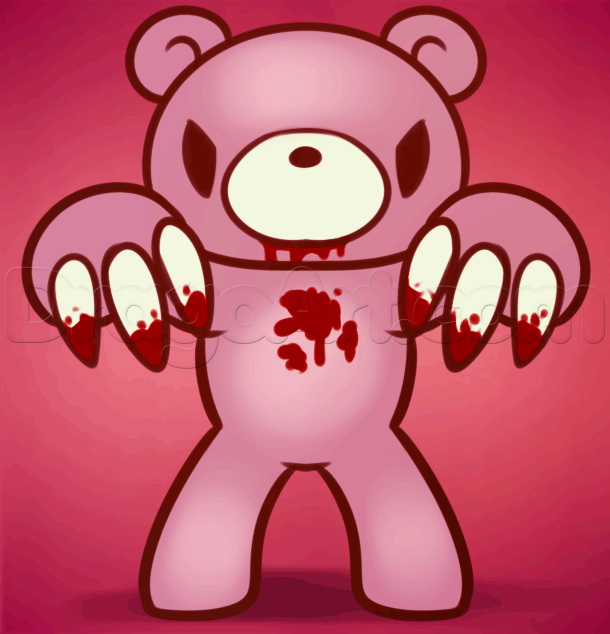 The strangest thing about Annie you would first notice besides her height at 6'4 is the bright pink full body bear suit she wears the white muzzle and pink chest often coated in blood. Annie has worn types of this bear suit constantly throughout her life,as she suffers from a type of Allodynia a condition that causes her to feel extreme pain at the slightest touch upon her skin. But she has come to live with this fact and has even turned it into a sort of weapon for better protection. The hands and feet of the suit are plated on the inside with steel that ends before reaching her knees and elbows. She finds they not only give a little more power behind her punches and kicks but also work as weights. In addition she also has steel claws on both her suits paws and feet that are retractable which she often uses to fight. Outside of the bear suit it could be said easily that Annie was no late bloomer with pale porcelain skin, a large bust size an almost perfect figure and legs that go on for days it is easy to see she is very attractive. Her hair is a short blood red that in attempt to keep out of her eyes uses hair clips with the face of her bear suit on it. Her eyes are a deep blue that seem to sparkle. She often can be seen with dark circles around them as she suffers from Chronic Insomnia causing her to rarely sleep. When not wearing her bear suit Annie is rarely if ever seen without a large smile often showing off her incredibly sharp pointed teeth.Her clothing she wears is often just a dark blue or black tank top with either a pair of black shorts,a skirt or in cold or raniy days a pair of skin tight jeans. A pair of black sneakers finished off this look. The one thing most noticeable about Annie is her energy,she has an insane amount of it,often saying its why she rarely sleeps you might just find her training painting or even planning future meals in the dead of night to help rid herself of it.Another thing you might notice is how happy go lucky Annie can be always with a smile on her face. She is the kind of person who would happily pull you into a bear hug and swing you around just because you said something that or did something that might be seen as nice for her. In fact it can be a bit unnerving how happy she always is, as she would often run into battle with cheerful laughing as she would fight. If someone were to challenge a crowd of people you might find her jumping up and down waving her bear paws in the air and shouting "Pick Me! Pick Me!" as if she had the chance to win a prize. One you get past that you might just realize how truly scary she can be,how she could kill a person without blinking an eye but she just often chooses not to. She herself is not sure why,maybe its because of a lifetime without feeling another persons touch,maybe it was the total lack of sleep over the years but what whatever it was it twisted her enough to create a hidden monster. A cannibal, that is what she was,she would often to make up the excuse for herself of how her body couldn't absorb iron or something,but if this is really true only she knew. She can often be seen eating dried sticks of meat,like jerky dipping them in honey.But it is easy to guess how she gets them as every time she comes back from a town her supply grows and her suit appears more bloody then normal. Annie loves painting,or just color in general,give the supplies and time she could spend the entire day painting,she didn't even need to have something to paint, sometimes she would just paint colors and patterns of beauty. The one thing better then her painting would be her cooking,no one really know what she does to the food to make it come out as it does but what ever she does it comes out heavenly,perfectly cooked and full of flavor. Some of the only thinks you might be able to do to upset her might be stealing her meat sticks and calling her by her real name Annabelle,or even worse saying her full first and last name, a name she would happily chose to forget if the name didn't hold small but somewhat happy memories for her. but all in all it still remains a simple but quick way to get her blood boiling. Much like you would expect when a person has Chronic Insomnia Annie rarely sleeps,so much so that she has dark black circles under her eyes. Sometimes she could be up for days,or even weeks at a time. It could be hard to tell that she suffers from it though from her large amount of energy. But because of this when she does sleep it is best to leave her be,wake her before shes ready and you or others may well regret it. Strangely enough she seems to get tired in the cold,much like a bear falling asleep for a long winter nap,the colder it gets the longer and deep she often sleeps. BackgroundAnnabelle Khananshivili came into the world on a bright sunny Tuesday morning,born into a noble family a small mercy because she was born with Allodynia a condition that causes her to feel extreme pain at the slightest touch upon her skin. If she had been born into a poorer family she most likely would of been abandoned to die but maybe it would of been best if she had because what her family did was much worse,they kept her out of sight from the public sometimes even locking her inside her room to keep her out of sight. She wasn't normal in their eyes and all because of the painful condition that she could not control or even wish to have. A little girl being unable to hug or be hugged by her parents without a pain like boiling hot oil or tar being not only poured onto her skin but flowed underneath it. Not that her parents ever hugged her,they weren't even what you would call parents,often leaving the child's care in the hands of the servants,mainly in the care of her nanny,an old women who always seemed to have a smile on her face and an extreme amount of energy that seemed almost impossible for someone her age to have.This women was the closest thing to a mother Annie ever had. Years would pass and Annie spent the time happily with her nanny listening to her read stories,teaching her how to paint and even cook when she could,Annie loved her caretakers food,and even years later would say that even with all the flavors and delicious tastes her own cooking had,she could never of gotten her food even close to how the old women had made her food taste. Her nanny was kind and sweet she did not cast her out for the condition she suffered from instead she often would try to create ways for them to spend time together,painting and cooking were some of then main activities.It was like this until her tenth birthday when she was given a bear suit, it was bright pink but unlike the current one she wore this was more like a large hoodie with rounded ears and almost cartoonish bear face on the top. The sleeves ended in gloves that were shaped to look like a bear paws and even had white pieces at the end to make claws. The first time she was able to hug someone without pain....she cried,she bawled like a baby,it was the closest thing to a painless touch she had ever felt. Things would go normal for a few more years until one day after a day of shopping one of the few times Annie would be able to go out,with arms full of art and cooking supplies. It seemed like any normal sunny day,it had been her birthday,but with happened on that day she would never forget how could she?....She had planed it after all.. They rounded the corner and came to see a scary sight,her home was up in flames like a stack of matches soaked in oil.But as her nanny hugged her tightly to her chest she was unable to see the wide smile on her face. She had planned it all out the shopping trip that day the gas line leaking,after all she knew about how her father would sneak a cigarette in the afternoon when his wife wasn't looking and it was easy to plan the fire to start in his study with a smile strike of a match,the countless books adding to the flames. Her nanny held her tightly petting her head trying to comfort her as the girls shoulders shook in what she thought was silent sobs but in fact her shoulders were shaking not by crying but because she was trying to hold back the laughter that tired to escape her lips. She got what she wanted she had her nanny,the one she loved more then her own mother who right now was burning alive inside the home was all hers now nothing could keep them apart. They got a home much smaller then her old home it made her happy to be truly loved but that happiness faded in the next few years,her nanny,her guardian grew ill her old age finally catching up with her. Until one day when she woke up again on her birthday,her 16th to be exact when she had found the old women laying in her bed her hair white as snow her wrinkled face was icy to the touch. She had died peacefully in her sleep but Annie couldn't let her go...she had become a part of her life...so she made sure she would remain so. The human body is very hard to take apart without the proper tools you know? Annie found she was able to answer a strange question she had asked for years. What do humans taste like? Pork was the answer the meat looked like beef but had a pork or sometimes veal like taste....it was like forbidden ambrosia,but it wouldn't last very long soon she would just have to find more.. It was after this first meal she had found her birthday gift from her now deceased nanny,a bear suit the one she wore now a days was the final gift she was given,she found that it was expertly made and breathed very well for a full body suit..maybe with some work she might even be able to use it when..hunting.So with one simple but costly visit to the blacksmith later and she had her newly added weapons to the suit. It wasn't long before she decided to get another weapon this time a bat of sorts,seeing that knocking out her prey was not only easier and quieter but more merciful if she knocked them out before killing them with her sharp claws. It wasn't long before a bounty was placed on her head and was forced to train herself to protect herself,it was hard work and over years of training alone only taking small breaks in between to make sure the world wouldn't forget about her. But she soon grew strong and flexible as she trained in the wilds,so if you ever see a person wearing a bright pink bear suit turn around and run,run and pray she isn't hungry. Abilities: Flexibility and fast reflexes: Over the long seemingly endless years of training Annie has become very flexible and has honed her reflexes not only for battle but even in the kitchen,one wrong step and you could badly injure yourself. Chef: Thanks to the lifetime of cooking lessons Annie had gotten she is capable of making a wide variety of meals,it might be hard for you to find a meal know in the Blues that she doesn't. Artist: One thing Annie still loves from her childhood is art,painting was always a good way to show her emotions,blending the colors together to create something new,it was always an amazing thing to her then and now. Sneaky Sneaky! : Over the years Annie has found that to be able to catch ones prey one must sneak up on them so thanks to a small part of her training and mostly do to the soft padded paws on her feet she found that easy to do. Butcher: Ever since that first meal all those years ago Annie found the taste of human flesh surprisingly delicious,so much so that Annie took care with who she picked and what she took like a Butcher cutting up parts on an animal. Weapon Description: Retractable steel claws that are attached to a large steel plating that surrounds Annie's hands and feet and travel up her arms and legs ending just below the elbows and knees. The claws on her feet normally remain retracted and hidden using them as a last resort. Weapon History: Annie paid a blacksmith to line the inside of her suits paws,and create the claws that go with it,with strong steel the best money could buy,she had gotten them made as to not only to protect herself but also for use with her hunting,the claws made striping skin and killing much easier. Weapon Description: A large black iron bat a bit larger and much wider then a normal bat,one might find this a bit strange but even stranger thing about it is the many large spikes that cover it some straight others bent slightly at the ends. Weapon History: Wanting to find a more merciful way to kill her prey,finally settling on knocking out her prey before she would use her claws to kill them,it was a small act of kindness that she showed her future food.So she ordered another blacksmith to make this bat of hers. Unarmed Combat:Teddy Bear Hug: Annie will rush up behind and enemy before quickly wrapping her arms around them and hugging them tightly squeezing as hard as she can to crush their ribcage. HoneyBear Hug: Rushing up behind the enemy Annie would wrap her arms around them and would perform a German Suplex lifting them up and falling creating an arch with her body as she slams their head and shoulders into the ground hard trying to break their neck while squeezing their chest trying to crush their rib cage. Dance Party! : This move can be used on two opponents if needed. Griping them on the back of the neck or on the wrist. Once she has a good grip she starts to spin faster and faster pulling them up as she does so. Once she reaches her max speed she would swing them down slamming them into the ground,or she will let go suddenly to send them flying,often into other objects. 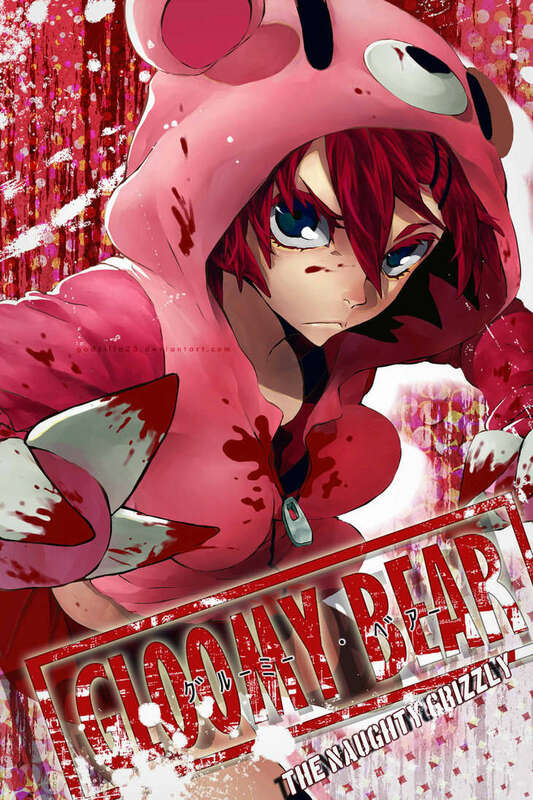 HoneyBear Punch:Without her claws out Annie would rush towards the opponent before launching out a punch aiming for the stomach but really this is a distraction for the other punch that would be aimed at the windpipe aiming to crush it. Weapon Based Combat:Dance Party:Solo:Rushing up towards the enemy she was spin as she digs her claws into the flesh of her opponent the momentum of her spin forcing the claws that dug into flesh and cloth to rip and pull away taking strips of clothing and skin with it. Batter Up! : Taking her bat she would rush towards the opponent with both paws wrapped around the handle before she would swing the bat at their head. Strike out! :Jumping up high griping the bat tightly she would swing it downwards trying to crush the head with the hard spiked bat. Masterpiece: Rushing up to the enemy Annie will start to spin hitting them with her bat over and over often causing blood to splatter to the ground like red paint. Night Night: Approaching silently behind a opponent,or maybe a chosen prey she would raise the bat slowly and swing either downwards or from the side to knock them out. Sleep Tight: Used after Night Night it is a simple move where Annie rakes her claws over the victims throat cutting it open and bleeding to death. This move can also be preformed on its own in battle.